Many kids who love animals want to be a veterinarian when they grow up! Check out the Vet Play Set we found on Amazon! It includes 24 pieces including a cat patient, a dog patient, and a cone of shame! Hurry and get the Melissa & Doug Examine and Treat Pet Vet Play Set (24 pcs) today for $29.99 NOW only $17.99 from Amazon! (Limit 3) Check out all of the Amazon deals here! Give young animal lovers everything they need to examine and treat pretend pets! 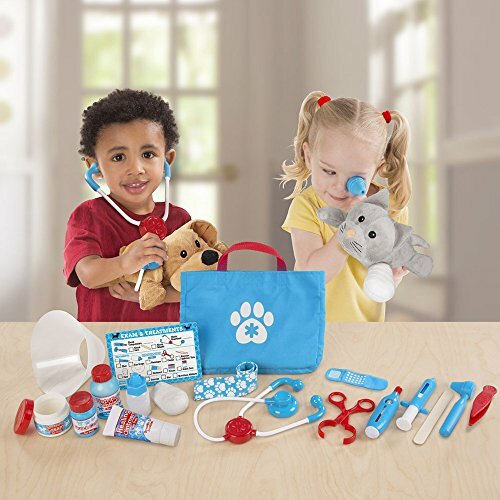 the 24-piece collection for aspiring veterinarians three and older comes with two adorable plush pets (a dog and a cat), and accessories galore, including a stethoscope, thermometer, syringe, ear scope, tweezers, and clamp. There are bottles, tubes, and tubs of pretend treatments and ointments, bandages and a cast for boo-boos, and even a neck “cone” to keep pets from licking! everything, including a reusable examination checklist, stores in a handy tote bag, so little Vets can make house calls!. Buy the Melissa & Doug Examine and Treat Pet Vet Play Set (24 pcs) from Amazon.